Puma coach Ian Myers let me in on how their team made it to state. After the NCS area meet Carrillo looked like a good bet to make state in the boys 1600m relay. Their 4×4 team had run 3:18.73 on April 28th at the Sacramento MOC Invite with their four best runners going (Severin Ramirez 49.5, Demetre Coffey 50.3, Will McCloud 50.3, Tyler Van Arden 48.8). That was the fastest time run this year in the NCS. Then came a big challenge to them just before the state qualifier. McCloud injured his hamstring early in the week. He is a 1:59.07 800 runner and is a solid member of the relay team. With him out their chances in the race to make state were now very much in doubt. The next fastest alternate on their team was Adesh Bassi who had a lifetime PR of 52.51 but he had only run under 53 twice in his life. The Carrillo coaches then had lots of debate about how to approach the race. They decided they could make the NCS finals with their alternate but state was another question. They did get through to the finals running 3:22.62. As it turned out a 3:21 would have sent them packing for home with just a 5th place finish. Their NCS finals team came through because of these amazing splits: Ramirez 48.9, Bassi 53.0, Coffey 49.7, Van Arden 47.8. 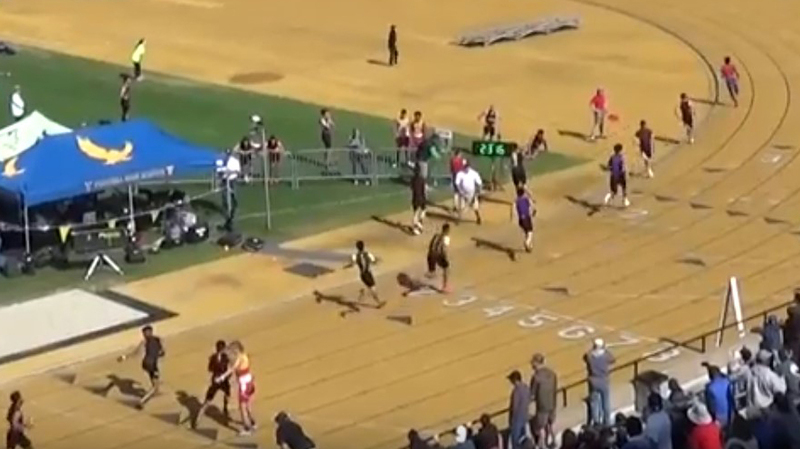 Van Arden is shown here, just after getting the baton from Coffey, crossing the finish line with 400 meters to go and about 10 meters behind the team that is ahead of him in in 4th place. His 47 split brought him home in 3rd. Add in McCloud at 50.3 and the team might have taken down the Empire record of 3:16.70 by the 1970 Santa Rosa team. It is still unclear if McCloud will be ready or not to rejoin the team for state. From coach Greg Fogg “McCloud has been looking good in practice and although he hasn’t raced in two weeks, we’re hopeful he’ll be able to race solid with this team; ultimately, we’ll have to wait and see how ready he is on Friday!